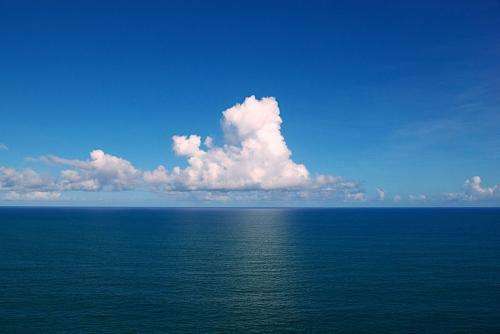 A 60 year-old theory to explain why seas surrounding islands and atolls are particularly productive has just been proven by a marine biologist from Bangor University's School of Ocean Science, working with a colleague at the US National Oceanic and Atmospheric Administration (NOAA). Open ocean environments don't appear to host vast communities of life, however, approach a coral reef and you'll inevitably come across an abundance of life, from increased levels of plankton to bird and marine life. When Charles Darwin first saw a coral reef he was perplexed by this. How could such a productive system exist in such a seemingly unproductive environment? The question of how such a productive system exists in such a seemingly unproductive environment became known as Darwin's paradox. 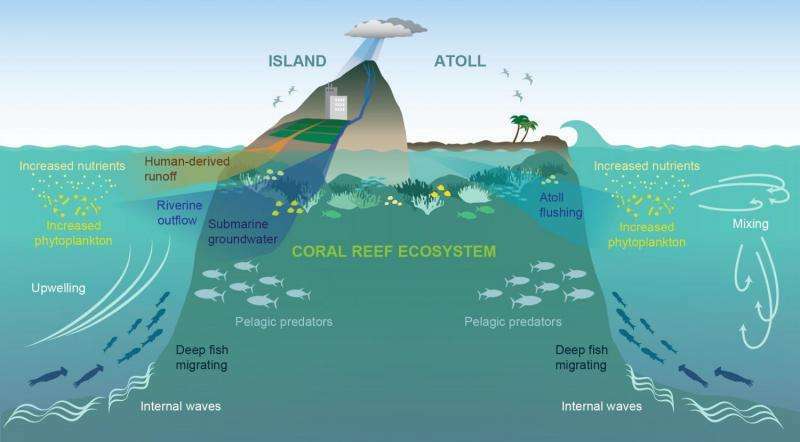 The Island Mass Effect is a hypothesis explaining why waters surrounding small islands, reefs and atolls support a greater abundance of sea-life than is found in the near-by open ocean. Writing in Nature Communications, the authors describe the extent to which the Island Mass Effect happens and also identify some of the key drivers in this 'positive feed-back effect', which acts as a life-supporting mechanism. The researchers measured a massive increase in phytoplankton in the waters surrounding 35 small islands and atolls in the Pacific Ocean. They recorded up to 86% more phytoplankton in these waters than is found in open oceans. At the base of the food chain, the presence of a greater number of these microscopic organisms has an effect right up the food chain to the top predators like tuna, who feed on the fish and animals supported by the phytoplankton. But why does the phytoplankton thrive in these areas? Once the growth begins, it becomes a self-fuelling cycle, a little bit of life brings more. The physical presence of the islands themselves creates circulation patterns and the positive feed-back effect begins, with fish being attracted to the phytoplankton, and larger fish and birds to the fish. Their droppings add 'fertiliser' to the water, encouraging production of yet more phytoplankton, which in turn supports more life. Human activity also feeds into the cycle. Run-off from agricultural fertiliser from land and other human activity also feed into the system- whether beneficial or not. Another important element identified by the researchers is the presence of lagoons contained within the atoll's reefs. Their shallow protected waters attract large numbers of birds and their basins are washed out daily by the tide, distributing nutrients into the shallow waters at their rim, and driving further phytoplankton growth. "The hypothesis was generally accepted, but had never actually been proven, beyond studies of single islands. Having proven the hypothesis, we have also established valuable baseline data about the abundance of marine life around these islands, some of which are the most remote in the world. "From an understanding of the drivers of phytoplankton production in the tropics, we can begin to explore how this productivity may become altered under future climate change scenarios such as altered ocean circulation patterns and what the biological knock-on effects may be, particularly to local fisheries." "There are clearly "hotspots" in productivity scattered across the open ocean which may act as natural refuges to future climate change. We identify these for areas with and without people - coral reefs rather ironically offer examples of some of the most degraded habitats that echo chronic human-induced change, but also boast some of the most pristine examples left on our planet." "The Island Mass Effect is nearly ubiquitous- we found it occurring in 91% of the coral reef ecosystems we surveyed across the Pacific. It is clearly an essential mechanism that provides energetic resources to support subsistence-based human populations. We now need to determine what other biological knock-on effects occur as a result of this and how all these mechanisms and interactions may become altered in this era of rapid change."